Tracer super-deep discharge LiFePO4 Batteries have been designed for many applications. This model is the 12v 24Ah Lithium Polymer option dimentions are 165 x 125 x 110 cm and its weighit is only 2000g! With the built in Tracer fuel gauge you can check the power level remaining in the battery. A touch of the button shows how much energy remains and whether you need to recharge. Quick, secure and easy connection. Many optional adaptors available. Just of the weight of a traditional sealed lead acid battery, our super-deep discharge LiFePO4 Batteries have been designed for many applications. 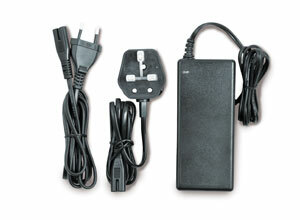 The compact 4A Charger (TR8205 included) will charge your battery quickly. For faster charge times, a rapid 10A charger (TR8206) is available. Please purchase separately. Tacer LiFePO4 battery packs are a totally sealed unit and waterproof to IP64 standard. They can be used with the neoprene pouch (supplied) or without just use the spring loaded grab-handle. Tracer LiFePO4 battery packs are suitable for many uses up to 30A continuous discharge. As standard we provide a T-Bar > 12V Socket and also Eyelets > 12V socket adapter. All Tracer LiFePO4 batteries conform to standard UN 38.3 which is the ONLY relevant safety standard for LiFePO4 batteries. Our battery packs have been through a rigorous testing procedure by UN certified inspectors. You should NEVER handle a non-certified LiFePO4 battery pack.